The winter and spring rains have kept us inside quite a bit, but we’ve kept our eye on the restoration area. The most notable flood event was December 27-30, 2015. Our on-site rain gauge measured 7.64 inches in the three day period, and water depth on the USGS gauge read at 19 feet for December 28, 2015! Check out the slideshow of in-stream flood pictures below. The flooding reached into Archey Creek Park, covering the field and spilling into the bathroom and concession stand. Our restoration is not meant to prevent this type of flooding. Floods like these will naturally occur periodically because Archey Creek Park was built in the floodplain with the purpose of accommodating the flows of a fairly large water system. Flooding allows the fish community and other aquatic species to access the floodplain, typically a terrestrial and disconnected land. By allowing flood waters to access the floodplain, aquatic species get to gorge themselves on frogs and other critters that are usually unavailable to them. As a byproduct they fill the pond as well – better fishing! The nutrients from the water also nourish the land, making the grass greener and trees healthier. For a natural ecosystem, flooding is a wonderful thing, but for joggers and ball players, we understand that it is a bit of an inconvenience. This is one way that humans and nature coexist within a river’s boundary. Despite all of the high water, the restoration site is still doing stellar with all structures performing just as expected. A section of the new walking trail, however, was…well…compromised. Unfortunately, this segment of the trail was placed too close to the stream bank, and the flood waters undercut the pavement. It was pretty impressive and a reminder of how powerful water can be, particularly in places without large tree root systems already established. There used to be land under there! Needless to say, repairs are underway and set to be completed by May 2016. The trail has been moved farther from the stream to protect it from flood damage like this. Pavement has already been poured, and Geocell, an erosion control product, will be installed on both sides of the trail. Geocell is a honeycomb shape of welded, high-density polyethylene strips. It will eliminate rutting around the trail edges and still allow water to drain through. Because so many visitors frequent the park, there are plans in the making to expand the trail system. This will allow walkers and nature viewers to access more of the park, see more views of the restoration project and river scenery, and raise that heart rate! After these spring rains and the Geocell is installed, we should be in good shape for the summer. We’re looking forward to seeing you on the trail soon! A red-shouldered hawk hunts for prey along the j-hook structure. 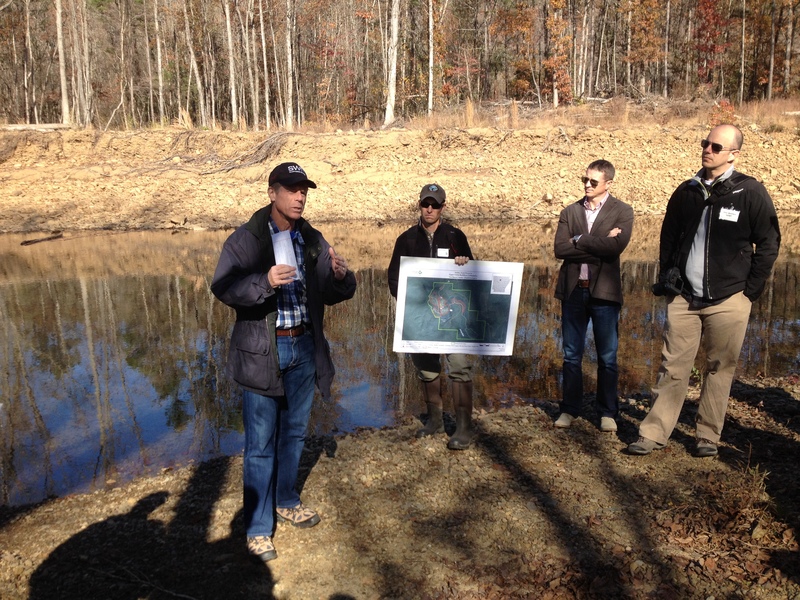 Mark Boling at a site visit to the Archey Fork in 2013. A great time was had last Thursday with our Archey Fork partners and friends in Clinton. The city of Clinton kindly hosted us all to a fantastic fish fry, following the dedication of the project, and we can’t say thank you enough. We are lucky to work in such a great community! The project tour promptly followed the dedication where the methodology for restoring the river was explained. 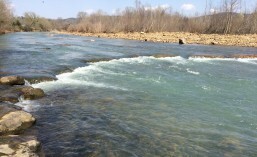 All the new structures in the river, including the toe-wood, J-hook, and boulder riffles were showcased and their function in the river described. If you missed it, no worries! As mentioned at the event, The Nature Conservancy will continue to monitor the project, irrigate the newly planted vegetation, and fund-raise for Phase III of the project over the next six months. If you are interested in volunteering in any of these efforts, please email Joy DeClerk (jdeclerk@tnc.org) we are always looking for new friends in the community that are interested in getting involved! Thanks again to the City of Clinton for the wonderful fish fry and to Southwestern Energy, without your substantial contribution this project would not be a reality. We are long overdue for an update and have lots to share! It may take several posts to catch everyone up to speed on progress, spring floods, growth, and park enhancements. First, let me invite everyone to the park on June 11th for a dedication of Phase II of the project, funded in majority by Southwestern Energy Company. Please click the link here for the Phase II Dedication Invitation. 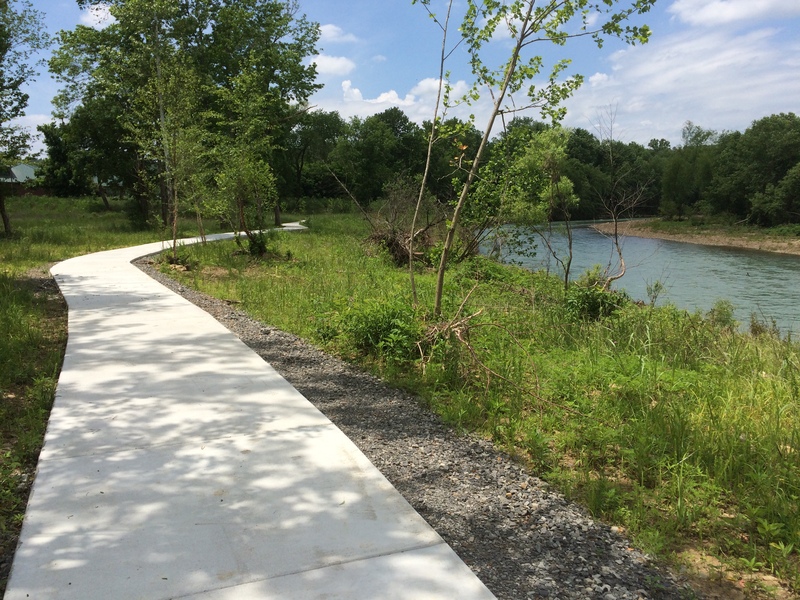 We will gather at Archey Fork Park, rain or shine, at 10 am for brief remarks, refreshments, and a tour of the project along the city’s new River Walk Trail. We hope you will join us, you’ll be amazed at the river’s new look! This new boulder home for the yellowcheek darter held well during all the May floods. We concluded Phase II construction in February/March of this year and proceeded to plant over 200 trees along the river banks. Thanks so much to Carol Corning and the Clinton High School students and especially to the Southwestern Energy employees who dedicated time towards our planting efforts along the river and making enhancements along the Archey Fork Park trail. AR TNC prescribed fire crew helping us for the day! 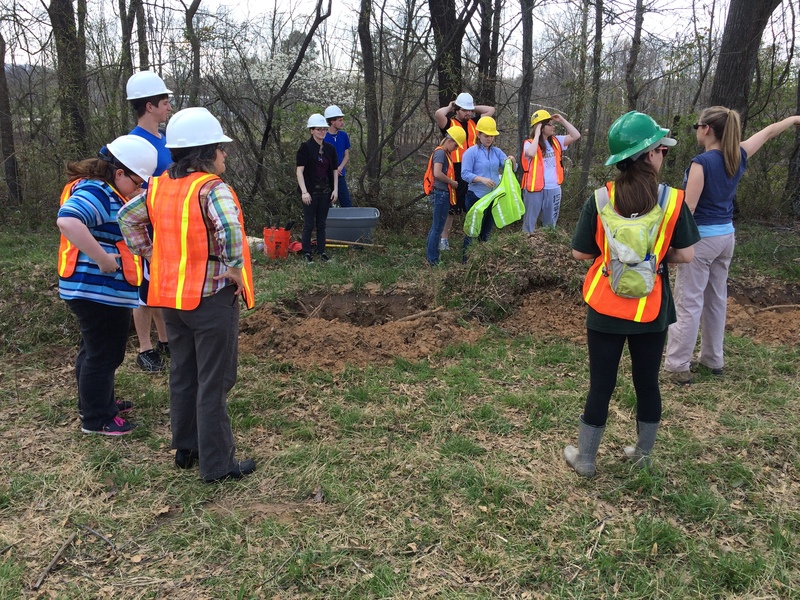 Thank you Carol Corning for bringing these Clinton High School students to help plant trees! 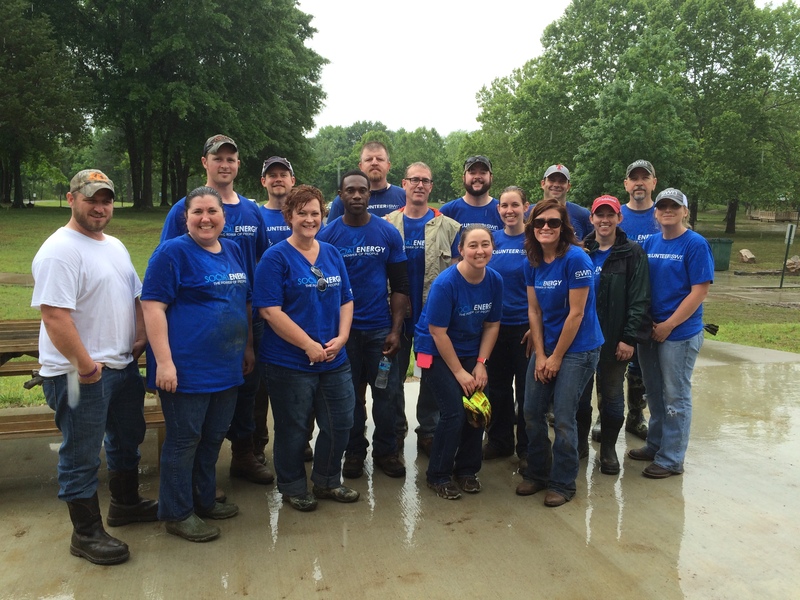 Although it was a stormy day, 16 Southwest Energy employees came with shovels and wheelbarrows in hand on May 15th to help with park enhancements along Town Branch at the east end of the park. The rain didn’t deter these folks as we brought in stone from Stevens Stone Supply and proceeded to make stone tree rings that we later mulched. These were not easy to build and everyone worked hard, thank you SWN! After all the rain these planted trees have had in the last several weeks, they are sure to do well in their new environment! As always though the heat and summer dryness will eventually come and we’ll be prepared. Despite only using our irrigation system once or twice last year, we will set it up again and every 10 days it doesn’t rain, we’ll pump a nominal amount of water out of the river to irrigate the newly planted trees. 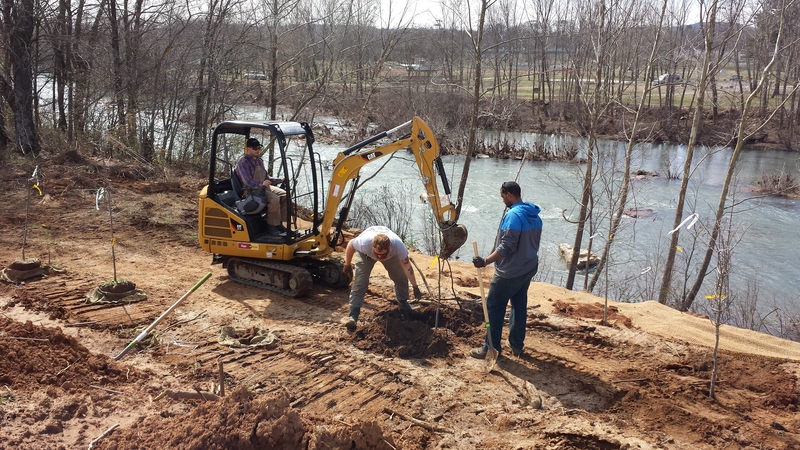 SWN employees volunteering their time to enhance the trees planted along Town Branch in Archey Fork Park. As many of you have seen for yourself, Dwight Wilson with the City of Clinton has been hard at work extending the walking trail into the newly acquired park area and along Phase I of the river restoration project. Thank you to Charles Wilson for clearing the area and Dwight for creating a way for people to see and learn about the restoration work we have completed, the trail looks great! We hope to see everyone at the June 11th event so you can see the good work for yourself. During the restoration process, we use game cameras to monitor the site to see how our structures perform during flood events, capture footage of construction work, and track wildlife usage. The pictures and videos are used in presentations, reports, and social media outlets such as this blog. On September 8, 2014, we experienced not only a harvest moon but also a supermoon. Behold, the Super Harvest Moon! This video was taken in Phase 1 Bend 1, looking downstream from the j-hook structure. http://earthsky.org/space/harvest-moon-2#super offers more information on what occurred this particular date as well as definitions of a harvest moon and supermoon. As I end the day by gazing at a big full winter moon in the sky, I think to myself what a wonderful, cold, yet sun-shiny post-flood day I got to spend outside. Since December, 2009 I have spent most Christmas holiday breaks watching the weather, precipitation gauges, and stream gauges anticipating high river flows for the stream sites we’ve restored. This often brings feelings of excitement and anticipation… and perhaps a little anxiety as I wait to see how Mother Nature will respond to our attempt to restore the right dimension, pattern, and profile to the river. On December 21st, 2013 one short day after completing Phase one’s construction, Clinton received a large amount of rain on already saturated soils and our project was put to the test. This holiday break proves to be no less exciting than last years! After loading up the family this sunny and frigid morning and heading north, I knew it was the perfect time to visit the Archey project. Mr. Steve Bone, after checking the rain gauge onsite, let me know that after 3.5 days of rain we received 8.04 inches in total! Looking at the South Fork Little Red River gauge, it was on the falling limb of a very large spike in flow – almost 10,000 cfs! I couldn’t wait to check game cameras, take pictures, and see it for myself. The clouds cleared and I was able to take great pictures and video of all our structures under high flow. I couldn’t be more pleased with our results, so I raced back to my computer to download the footage and get it posted ASAP…. First, you can view this short clip of construction of the toewood structure in Phase II ending with the flood event of January 2-3, 2015. You will notice the water rose almost up to bankfull elevation and well above the toewood structure onto the transplants on the first bench. One of our cameras upstream even went under water! Finally, check out these photos taken today on the falling side of the flood starting from upstream in Phase I, going all the way through 5 riffles and 3 pools to the downstream end of Phase II. 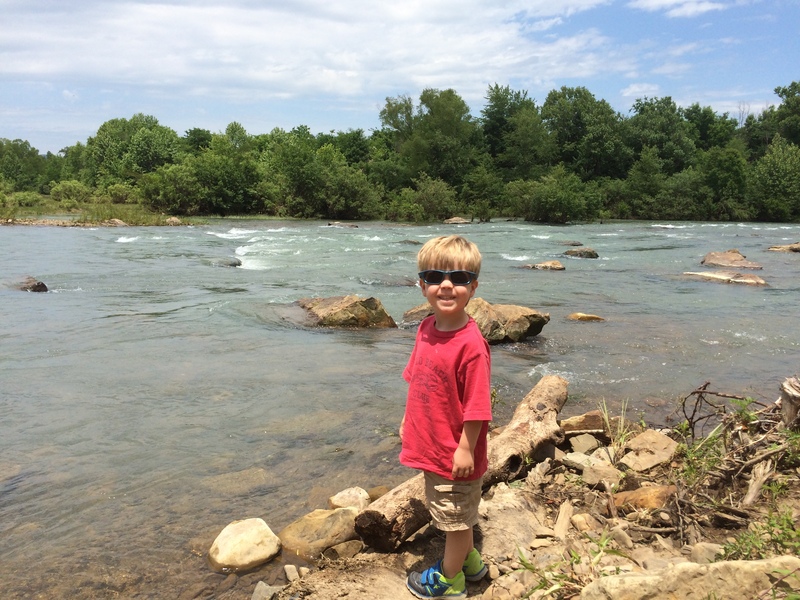 Notice all the great riffle boulder habitat that creates the large waves, perfect for boating, during high flows. This also happens to make great habitat for the Yellowcheek darter and many other riffle obligate fish! As we wrap up our work on Phase 2 of the project, you’ll be sure to see more of our construction footage and subsequent floods. To complete this year’s work, we are teaming with the City to remove the invasive species Chinese Privet that has taken over much of the park area. We will replace that area with large hardwood tree transplants from other areas of the river corridor. This will insure the long-term stability of the stream banks once the larger tree roots take hold. We are also helping to layout the additional walking trail that allow people to walk the entire restoration project and see the good work that’s been done from upstream to down! Feel free to pose questions and/or comments on the project here on our weblog! Thanks for your continued support and interest!